Have you ever heard of paint pyramids? I hadn't until I walked into the garage while Chuck was painting something. My first thought was How could I have not known about these?! You can pick them up for about $5. These are surely a crafters friend as I no longer have items stuck to the paper or cardboard. Genius! My cutting boards see their fair share of use. Unfortunately running them through the dishwasher does not always do the trick. I could use bleach to get rid of the stains, but I don't like the idea of using bleach on them. I rub half a lemon over the board and let it sit for about 20 minutes. Wipe the board off and the stains should be gone. An added bonus is that lemon is suppose to be a natural disinfectant. While baking cookies for a bake sale last week I went to measure out brown sugar and it was hard. I mean hard as a rock. The solution was to place a damp towel over the brown sugar and microwave for 30 seconds. I did have to stir and repeat a few times to get it softened enough. Being able to scoop your brown sugar is a good thing! The stool that is keep in the bathroom is an item that we found. While at the grocery store years ago we watched someone take a bunch of things out of their trunk and dump it all into a cart return. You know what they say... "someones trash is another persons treasure." We needed a stool for Megan to reach the sink so we gave it a new home. Functional... very. Pretty... not so much. The cheapskate in me could not see buying another stool. No matter how much I disliked the current one. Rhonda has such great ideas and when I saw the transformation of her plastic stools I pinned the idea for later. This was on the to do list before Christmas and finally made it to the top. I am a happy girl to see the dated blue go bye bye. This week has been the coldest of the season. Making cookies for the school bake sale. Chuck looking up additional information after a question on a Bible trivia card. Trying out a new style. As I strive to find joy I have realized that I need to make time for the things I enjoy. It is easy to say I don't have time, don't want to drag everything out, that I have other things to do that are more important... I could go on... To have true joy there needs to be a balance and I am working hard to find that this year. This was my inspiration for the project. I don't have burlap and didn't want to spend any money on this project. I thought about using some muslin and when I walked into my craft/sewing area I spotted this. I had keep the legs when I cut off my torn capris. Perfect! What a way to "use it up!" For the hearts I pulled out my scrap box and searched for pieces of homespun red. When making the hearts I traced the entire heart on the back of the fabric. Before I cut I folded it in half and made sure the bottom point and the middle of the top are lined up. That way when I cut I am sure to have both halves of the heart the same. I used heat and bond to attach the hearts. I love that stuff! I used hot glue to put it all together. When I went to get the twine I noticed a bag of mini clothes pins in the box. I thought I would see how they looked. I loved what it added to the banner. When I look at it I think about warm days and fresh laundry on the line! I have always heard "use it up, wear it out, make it do, or do without" and it seems that many more people are finding this a way of life. The price of things keeps climbing and I am finding the quality declining. That means things need more repair and wear out much faster. Mending is one of those lost arts that is making a come back. These boots were a Christmas present and lost a button that I sewed back on. I am now kicking myself that I didn't take the time to reinforce the other button. Towels are another item that I find the quality lacking. I had two towels where the hem came unraveled. I know many who would have tossed these and purchased new towels. I purchased a spool of thread to match and about ten minutes at the machine and these were back in business. I absolutely love capri pants! I had two pair that I had wore to the point that the knees became so thin they ended up tearing. They are so comfortable that I wasn't happy about parting with them. Then I thought why not cut them off and make shorts. Perfect for wearing around the house! I would love to hear if you mend. If so how far do you go... do you darn socks? Check back tomorrow and see what I did with the material cut off of the pants. This afternoon I attended a showing for a lady I lived across the street from as a child. Sarah was actually my first babysitter and I later watched her oldest son. We had to wait in line for over two hours to get into the viewing room. That says a lot about the life she lived. As I approached the family I noticed that they had the following quote under one of her pictures. Today I wondered what the purpose of my life is. Then God made me realize my purpose is "you." I have been thinking about this all evening. How many times have I wondered this exact thing? How many times have I thought that there has to be more to my life? Something bigger, something with more meaning. This made me wonder what if? What if my purpose is for the "you" that happens to be in my life today. My husband, daughter, family, friends and maybe even the stranger at the grocery store. I, like many of you, see people going on mission trips, raising huge sums of money for charity and making a big impact. I think sometimes we get so caught up in the big that we forget that it is really the little, everyday things that can have just as much, or maybe more, of an impact. It is quite possible that the purpose is to live my life in such a way that I leave a positive impact on whoever the "you" in my current life happens to be. Mama you are how old? Making time to do something I enjoy. Made something for a basket that had been empty for far to long. Even when it is cold the sight of the sunshine lifts my spirits! Tackling some put off task. My imagative crew on their fire truck. 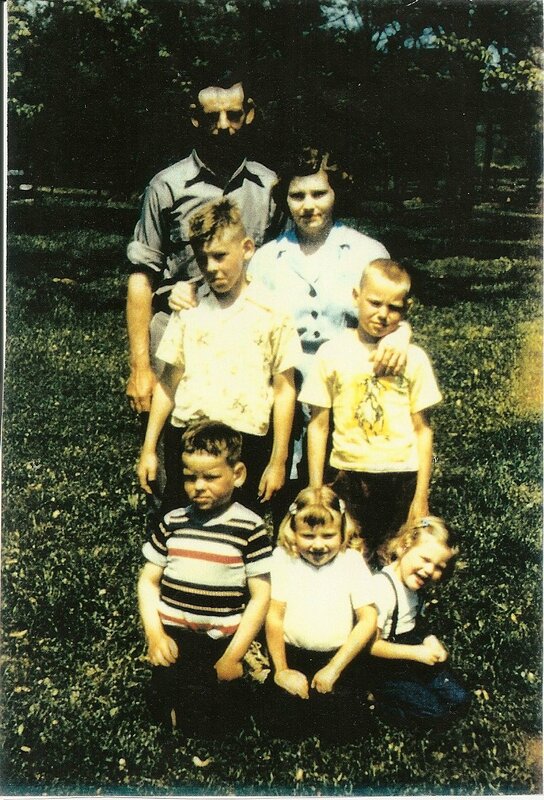 This picture is of Mom and Pop (my grandparents) and their five children. The youngest child is my mom. This picture was taken in the early 1950's. I am guessing '53 or '54. 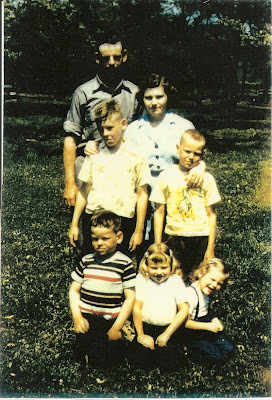 Both of my grandparents were raised on depression era farms and then later raised their children on a farm. Mom keep record books of their income and expenses and I am fortunate to have one of the journals. You might think I am crazy, but I find things like this very interesting. 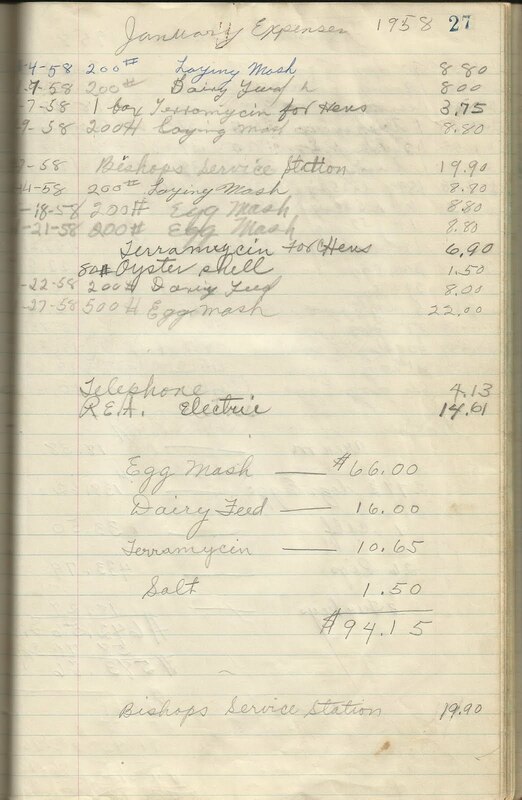 That is a lot of eggs that were sold. I wonder how big the flock was. 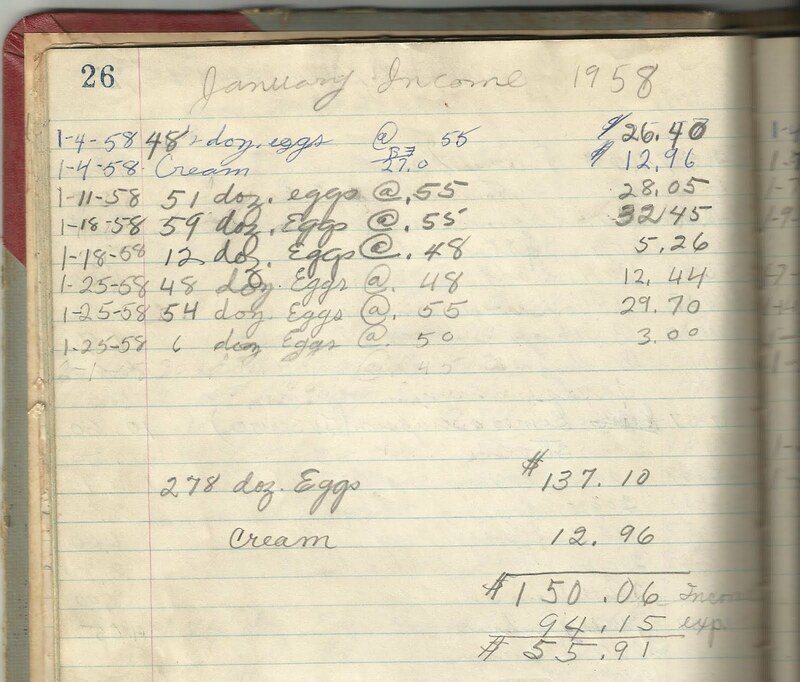 Can you imagine being able to get a large portion of your income from selling eggs? I am not sure you could do that in this day and age. So many regulations to sell things and the mega farms tend to make it hard for a mom and pop operation to make it. 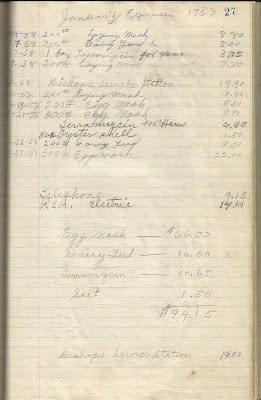 You can tell how times have really changed by the simplicity of the expenses. Smell Good in a Mason Jar!